"How you look at other people makes you the kind of person you are. If you look at people and want to help them, you will be full of light (goodness). But if you look at people in a selfish way, you will be full of darkness (evil). And if the only light you have is really darkness, then you have the worst kind of darkness." In baseball, having a "good eye" means that the batter doesn't swing at bad pitches, only "hittable" strikes. 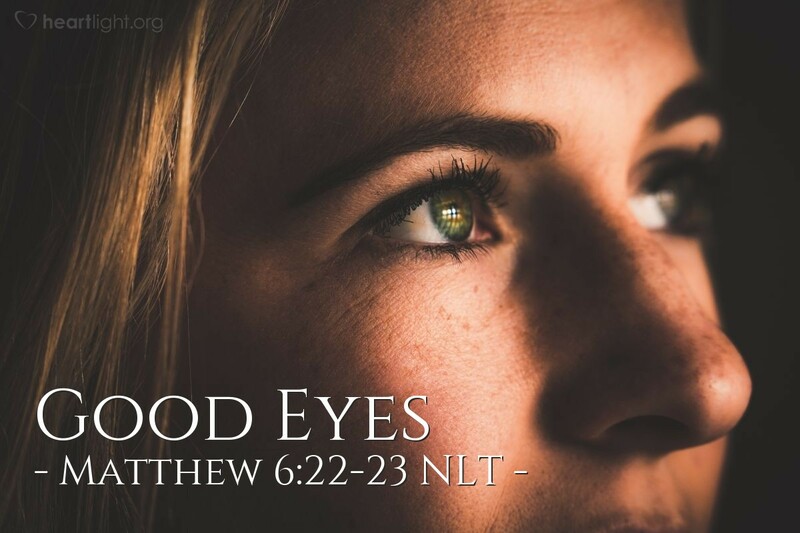 In life, having a good eye means that our hearts focus on the right things, or better yet, the Right One, rather than letting our eyes wander over and covet many things that can't buy our happiness. We refuse to swing at any of Satan's "unhittable" pitches! Focusing our spiritual sight, our lives, on the wrong things always leads to ultimate unhappiness and destruction. That kind of sight is never satisfied with what it has; it has an insatiable appetite to possess, acquire, and achieve more. Such an attitude ultimately robs life of joy and replaces the Father and his Kingdom with trinkets and temporary toys. O precious Holy Father, help me keep my sight focused on what is good. I want to focus on you, your grace, and your Kingdom. You alone have the meaning of life. Fill me with your light. In the name of your Son and my Savior I pray. Amen.